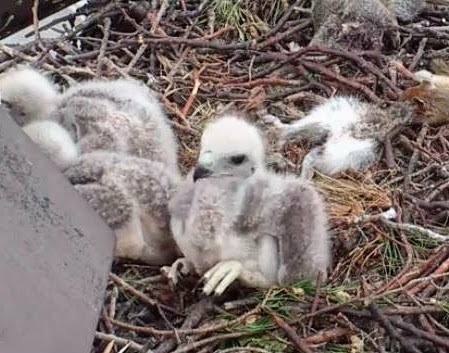 It's been nearly three weeks since the first of three hawk eggs hatched at the Ageloff nest site and the babies are getting bigger by the minute. This is a screenshot taken today from the Ave A Nest Cam, which shows how leggy they're getting. 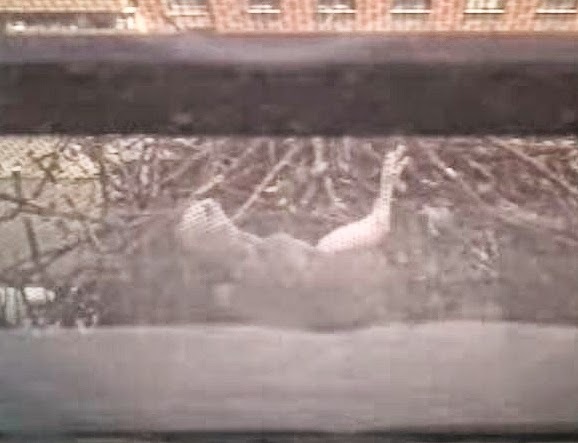 The other two nestlings are up against the window, out of frame, but you can see from this angle how small the nest is. Windows on the building across the street are visible at the top of the image, and the white blob on the far left is a truck passing in the street down below. Two Hawks has a really nice shot of two of the hawklets peeking over the edge of the nest. 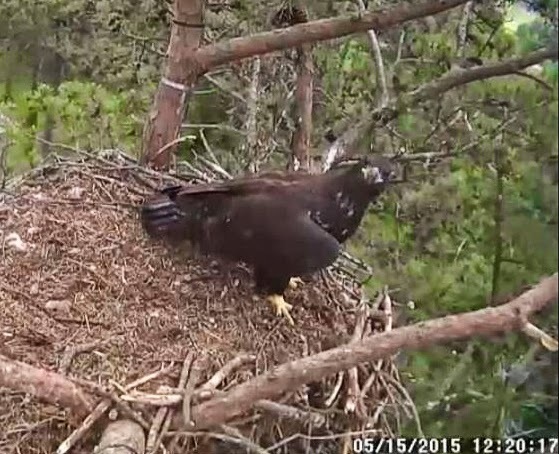 And Urban Hawks has some video of Dora and all three kids (go to the 27:00" mark). Meanwhile, Morningside Hawks has been keeping tabs on all the Manhattan hawk nests and has some updated stats here. 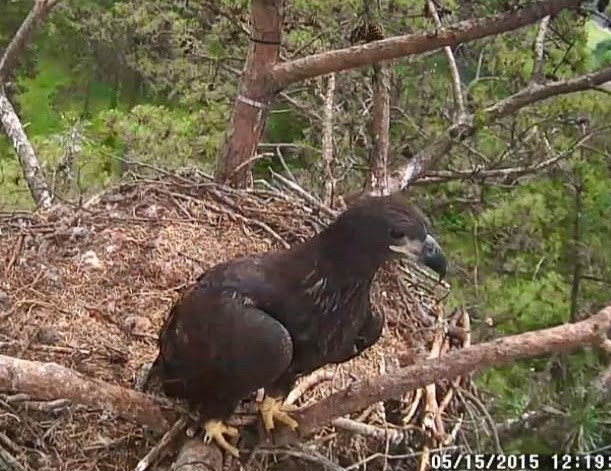 I've been following the Cornell hawk cam, which is a great source of information. Their hawks are just a few days younger than ours on Avenue A, and they have reached what I consider their cutest phase - when they sit back on their rumps with their clown feet sticking out. 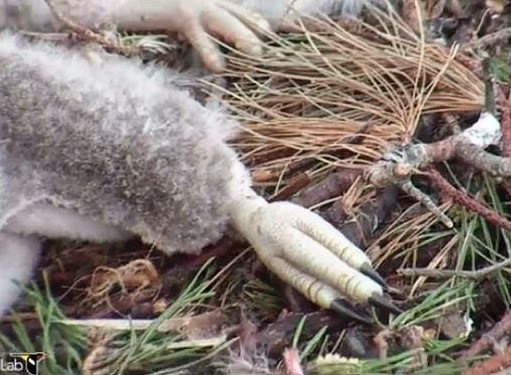 There was an interesting discussion on the Cornell site this week which talked about the birds' development and how the legs and talons grow first and fastest. Once the legs are strong enough, the babies will be able to stand. At the moment, they're still toddlers. Another discussion focused on how hawks see. How can they spot a rat from three blocks away, or maneuver through the trees while chasing a pigeon? I found this informative video that has some great high-speed footage of birds grabbing a target in mid-air, as well as explaining how raptors perceive color. 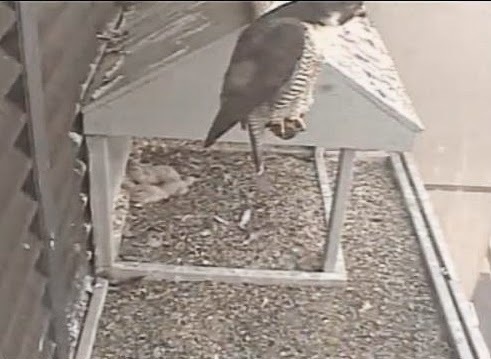 Activity at the 55 Water Street falcon nest has increased since four babies recently hatched. This screenshot shows mom, Adele, guarding her fuzzballs while gazing out over the FDR Drive. The blob below and left of her is a pile of baby falcons. They don't build a fancy nest like the hawks. 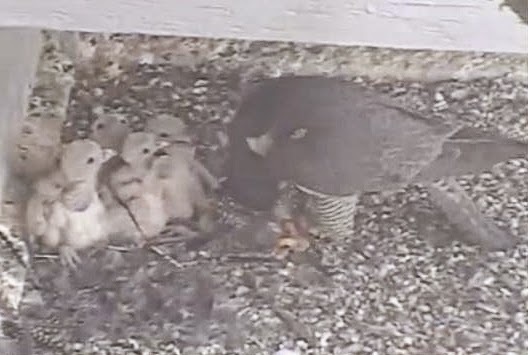 You can see all four falcon babies here as Adele feeds them lunch. It looked like pigeon. 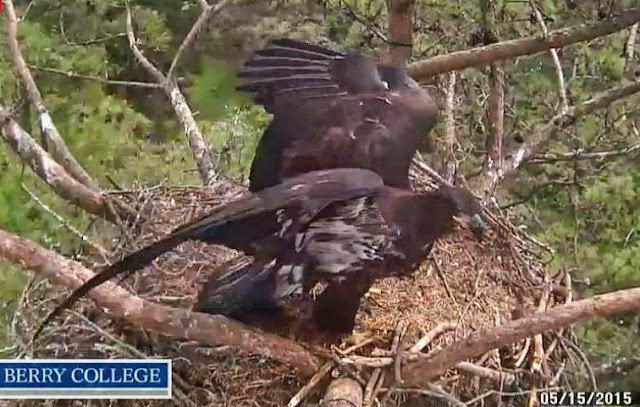 Lastly, I've been following the Berry College eagle nest for a couple of years now and have become pretty attached to their eaglets. This year's sibling pair fledged the nest a few days ago, but I managed to get some screenshots of the youngest (I believe) making one last visit to the nest last Friday. When you observe these birds hatch, grow, learn to feed themselves, then finally fly away, it's impossible not to get a little emotional.